I was born and brought up on Bottom Farm in the beautiful Northamptonshire village of Hargrave. Following university, I joined my parents in the family business as a fourth generation farmer, but it was soon evident that farming, driving tractors and growing crops alone was not going to sustain the family business for another four generations. Duncan’s Great Grandfather George Farrington at the wheel of an early tractor, bringing home an impressive load-full of sheaves of barley ready for threshing. Harvesting wheat with binder machines leaving the complete seed and straw in sheaves before being taken away to thresh at a later date. Enjoying a rest. Duncan's Great Uncle, Lance Farrington (on the right) next to Duncan's Grandfather, Fredrick Farrington. Great Uncle Walter Hawes planting potatoes. 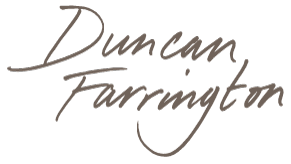 Robert Farrington (Duncan’s father) joins his father on the farm. Here they are harvesting barley, with his sister Freda helping as it is all hands to the pump. Frederick’s home becomes one of the first in the UK to run on renewable energy as they install a wind turbine. Duncan researches cold pressed rapeseed oil whilst at Wye College, University of London. After graduation he returns home to work with his father at Bottom Farm. Duncan becomes a LEAF (Linking Environment And Farming) farmer. Bottom Farm becomes a LEAF Demonstration Farm, launched by actress Tamsin Greig (The Archers, Black Books, Green Wing, Episodes). Farrington Oils is born. Duncan and his mother Angela produce 100 bottles of Mellow Yellow on the first day. In this first year 6,500 bottles are produced. Adam Gray starts using Mellow Yellow in his Michelin starred restaurant. Mellow Yellow reaches the shelves of its first supermarket, Waitrose. Eli uses Mellow Yellow to create her Honey & Mustard Dressing and Mayonnaise, both of which collect Great Taste Awards. Mellow Yellow is launched in Booths, Ocado and Sainsbury’s. Eli creates her Classic Vinaigrette, Balsamic Vinegar Dressing and Garlic Mayonnaise adding to the range. BBC “Bees, Butterflies and Blooms” series features Duncan and the wildlife on Bottom Farm. The entire Mellow Yellow range receives Vegetarian Society accreditation and approval from Coeliac UK. Chilli Oil is introduced to the Mellow Yellow range. Duncan wins the Carlsberg UK, Northamptonshire Local Food Hero. Farrington’s Mellow Yellow selected as partner by Michel Roux Jr’s Cookery School. Bottom Farm receives a royal visit from the Duke of Gloucester. Annual production is over 400,000 bottles. Mellow Yellow launches in Morrison’s. Duncan completes his next production investment by doubling the bottling line capacity with all British engineered machinery. Duncan's next expansion further increases capacity with British engineered machinery as well as adding a development kitchen for Eli to create even more delicious Mellow Yellow products. Duncan receives his Fellowship of the Royal Agricultural Societies (FRAgS) at the House of Lords for his work with LEAF and innovation & research into cold pressed rapeseed oil. Farrington's Mellow Yellow Chilli & Cumin Dressing is launched. 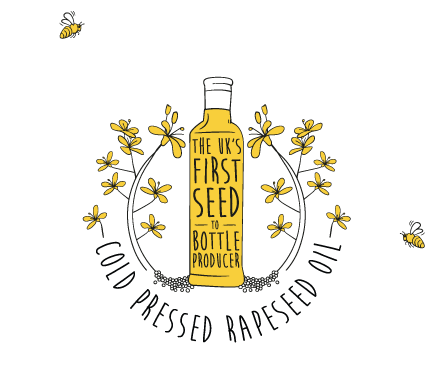 Returning to my university research on rapeseed oil, a passion was awoken, which quickly turned into an obsession for the fantastic culinary properties and nutritional benefits packed in those tiny little seeds. 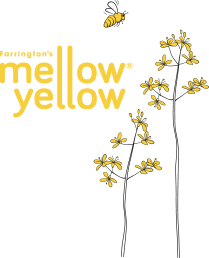 Following years of research, I launched Farrington’s Mellow Yellow® in 2005 as Britain’s first ‘seed to bottle’ cold pressed rapeseed oil. With my Mother’s help bottling the oil, I would drive around local shops in my old battered car, gaining customers who remain loyal to this day. Later in our farmhouse kitchen, my wife Eli, with her superior taste buds and trusty jam jar to hand, started creating salad dressings and mayonnaises to add to the range. Today, our Mellow Yellow range is sold in shops and restaurants nationwide and abroad. We now produce as many bottles in a day as I did in the whole of our first year. Provenance remains as important as ever and with our fantastic team we ensure that the same passion, attention to detail and quality ingredients still goes into every bottle we make.